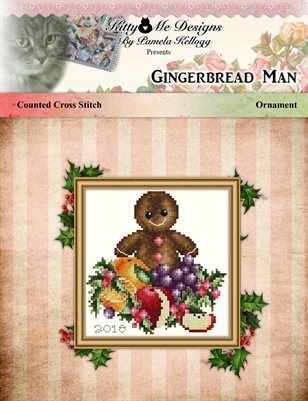 The Gingerbread Man Cross Stitch Christmas Ornament Pattern was my design for the 2003 Just Cross Stitch Ornament issue. The stitch count is 64 stitches wide X 63 stitches high. On 32 count Jobelan over 2 fabric threads (or 16 count Aida) the finished stitched area will be 4 inches high X 3 7/8 inches wide. DMC Embroidery Floss and 1 spool of Kreinik #4 Braid.